Did you ever hear of a fish that could live our of water? The lungfish can. As one would guess by its name, the lungfish has a lung, as well as gills, that enables it to live out of the water. Lungfish live in Africa, South America, and Australia. 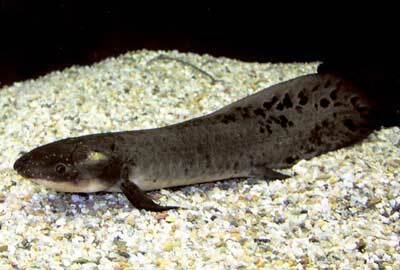 The African lungfish is probably the best know it is also called a mudfish. The African lungfish ahs an eel-shaped body that may grow to be over a foot long. It lives in swamps and muddy rivers of Africa. In the summer the streams in which the lungfish lives may dry up for months at a time. As the dry season nears, the lungfish burrows deep in the mud. It can spend the whole summer in its cocoon of hardened mud beneath the dried-up stream bed, getting air through a small hole and living on fat stored in its own body. When the wet season comes, the water softens the hard mud cocoon and the lugnfish swims about again.